Before the likes of Roger Federer, Andy Murray, Serena Williams and Novak Djokovic came along, two of the biggest names in Wimbledon history were Björn Borg and John McEnroe. The respective Swede and American tennis players made headlines for their stern, focused, and sometimes controversial approach to the sport, and they both partook in a rivalry with one another that would eventually come to a head during their title match at the 1980 Men’s singles final. It’s the kind of real-life sports rivalry that would make for great entertainment, whether it’s in real life or in a more dramatized format, and the latest example of the latter – director Janus Metz’s Borg vs. McEnroe – succeeds in giving us some truly tense recreations of that historic tennis match, and a halfway decent character study of both men, at the height of their pressured and hostile nature while giving their all to the sport they love. We begin in 1980, as Borg (Sverrir Gudnason) is living in his luxury condo in Monaco with his fiancé Mariana Simionescu (Tuva Novotny), and has been the current Wimbledon championship title holder for four consecutive years, with the press and fans putting pressure on him to make it to five years during the forthcoming Wimbledon. Meanwhile, McEnroe (Shia LaBeouf) is busy alienating audiences and umpires with his unsportsmanlike tantrums and volatile behaviour on the court, and his frustrations with the media focusing more on his rivalry with Borg than his actual tennis-playing abilities. When both men come to Wimbledon for the championships, and slowly but surely make their way through the rankings up until their fateful finals match together, both men face the pressures of the media and the personality clashes with those closest to them, which would end up making for one hell of a final showdown. And boy, what a showdown it is; when the film does begin to recreate the historic Borg vs. McEnroe match of the title, it’s genuinely exciting, and executed like the most intense action sequence you’ll see in a film that is otherwise as far away from action as you could possibly get. Tennis has a long history of not feeling very cinematic when it’s portrayed so heavily in film, as the prospect of two players hitting a ball to one another isn’t exactly the most exciting thing to watch during a film, and if not done very interestingly it can get very dull exceptionally quickly; the climactic tennis match in this film is to my knowledge the closest that tennis has ever come to truly feeling like an action scene, one that seriously leaves you on the edge of your seat and near breathless as you see these men give their all to try and win. It’s exciting stuff, and it’s recreated effectively by director Metz as well as the physicality that actors Gudnason and LaBeouf bring to the scene, and it’s the undisputed highlight of the entire movie, one that makes everything else beforehand a necessary evil to get through, because at least you are rewarded with an exhilarating example of on-screen tennis if there ever was such a thing. By “necessary evil”, it shouldn’t be taken as meaning that the rest of the film is a slog to get through; not quite so, as everything leading up to that grand climax is an interesting attempt at a character study of these two men, one that has as many setbacks as it does successes. Between both Borg and McEnroe, it’s Gudnason’s Borg that arguably has the larger focus; we get to see more of his own backstory from his childhood and guidance under his mentor and coach Lennart Bergelin (Stellan Skarsgård, in his first fully-Swedish role since 2008) up to his rock star-like status in the film’s present day, and due to us spending more time with him we are given more of an understanding to his way of thinking. McEnroe, on the other hand, gets slightly less focus in comparison, with parts of his own childhood including his overbearing parents being mostly glossed over, and with no solid explanation behind his rather anarchic behaviour whilst playing he just comes across like a two-dimensional hothead for most of it. It’s a little disappointing to not see McEnroe get a fairer share of the focus, not just because he makes up half of the film’s title, but also because this is one of LaBeouf’s best performances in years, in which he cleverly uses his own shaky public persona to properly get into the mind-set of the similar character he is portraying, and just like the real Shia LaBeouf you can totally believe it when this guy is being so outlandish and curt to anyone who threatens to stand in his way. The film also drops notes at several points about there being a real rivalry between the two players, but aside from a couple of scenes where they either just stare at each other quietly or sit there without uttering a word to one another (they don’t even share dialogue together until the film’s final couple of scenes) there doesn’t ever seem to be much of an antagonism between them. If they wanted to do something like Rush, which also focused on the rivalry between two famous sports personalities, then perhaps they could have shown one or two scenes that establish their inner competition, whether it be friendly or serious; that way, we as an audience could understand why they would be considered genuine rivals in this field. The focus, however, remains on the individual men and, in the film’s outstanding third act, the game itself, and when it puts its focus in the right place Borg vs. McEnroe is a good game to witness. 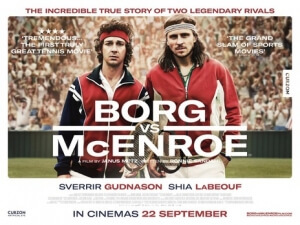 Borg vs. McEnroe is an intriguing attempt at a character study of rival tennis players Björn Borg and John McEnroe, and while that angle has its strengths and weaknesses, it all comes together for an outstanding third-act recreation of their signature match against one another in the 1980 Wimbledon Men’s singles final.